Original advertising card depicting “The Bridal Party” from In the Land of the Head Hunters, ca. 1914. It was thus a great stroke of luck that in the 1960s a badly damaged copy of the film was discovered at The Field Museum in Chicago—likely rescued from a movie house dumpster. The museum preserved it as a record of aboriginal life on the Northwest Coast, with no thought of its historical significance to the development of modern cinema. Until now, the only version of the film available to scholars or the general public, was one produced at the University of Washington in 1973 from this fragmented copy. Retitled In the Land of the War Canoes, and synched to a new naturalistic soundtrack, this version was distributed as a “documentary film” even though this genre did not exist in 1914. 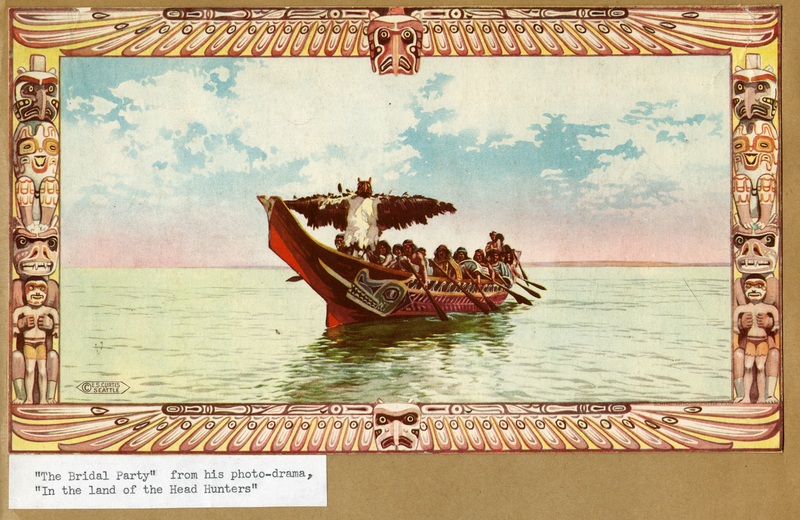 Based on recent archival discoveries, a collaborative team including many contributors to this book, working closely with the Kwakwaka’wakw, have overseen a new restoration of the film. The new version, available in late 2014 on DVD and BluRay from Milestone Films, has returned the original title and inter-title cards, added long-missing footage, and restored the original color tinting and publicity graphics. It is also accompanied by a marvelous performance of the original musical score by Vancouver’s Turning Point Ensemble. Though still incomplete, it is now possible to get a sense of what audiences in 1914 would have seen and heard in theatres. George Hunt (with megaphone), Edward S. Curtis, and actors filming In The Land of the Head Hunters, 1914. Our new edited volume, Return to the Land of the Head Hunters, brings together leading scholars and artists from a wide range of fields to reassess the film and its legacy, as well as the restoration project itself. The multiple authors offer accounts of the film’s production and circulation, Kwakwaka’wakw views on its depiction of cultural practice, and innovative theoretical perspectives on film genre, indigenous agency, and colonial modernity. Returning to the film with fresh eyes, our book also argues for a re-appraisal of Curtis’s larger body of work, and a way out of the critical deadlock that has limited analysis of his photographs and film, largely by ignoring the motivations of his Native subjects and partners. 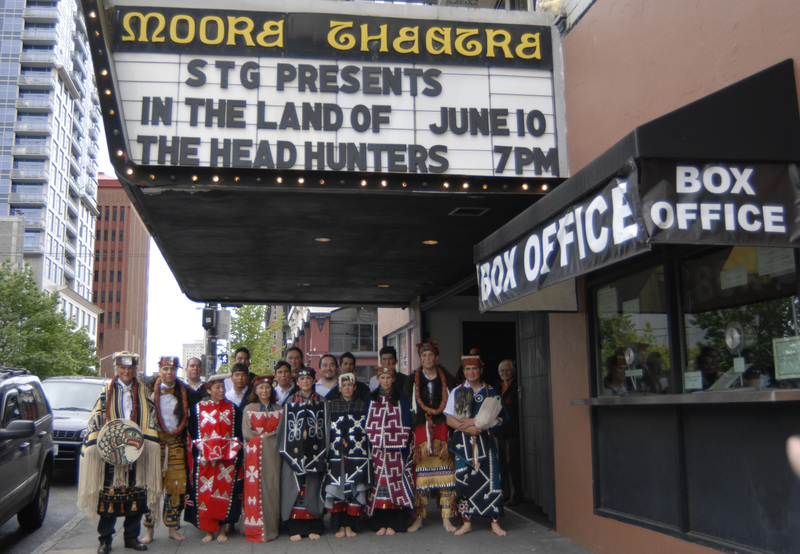 Gwa’wina Dancers under the Moore Theatre marquis, Seattle, June 10, 2008. Rather than documenting Native life in 1914, Head Hunters documents a moment of cultural encounter and creative collaboration between Curtis and the Kwakwaka’wakw actors and consultants who were performing his scripted version of their own historical past for the camera. Moreover, they were doing so at a time in Canadian history when the potlatch was outlawed by the federal government in an attempt to force their assimilation. 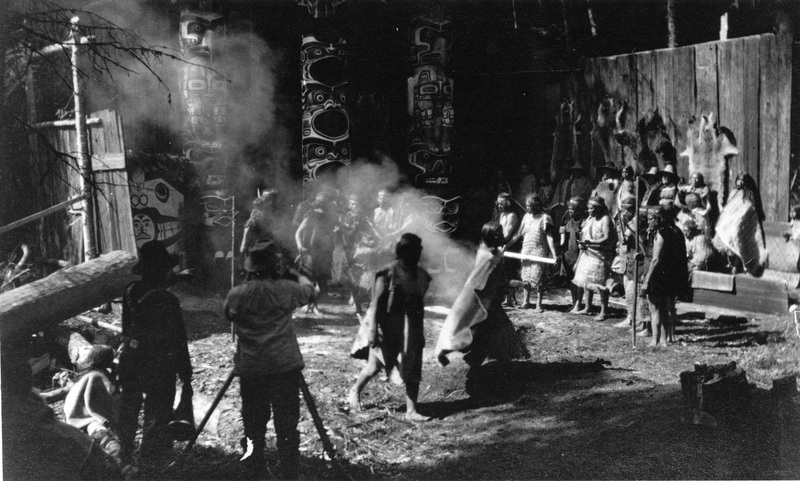 By adapting traditional ceremonies for Curtis’s film while refusing to play stereotypical members of a “vanishing race,” the Kwakwaka’wakw retained embodied cultural knowledge despite the prohibition, and they made a vital contribution to the development of the most modern of commercial art forms—the motion picture. For a century now, this film has constituted a lens through which to reframe and re-imagine the changing terms of colonial representation, cultural memory, and intercultural encounter. Return with us to the Land of the Head Hunters. Brad Evans is an associate professor of English at Rutgers University. Aaron Glass is an assistant professor of anthropology at the Bard Graduate Center. This book was published in Native Art of the Pacific Northwest: A Bill Holm Center Series. Hear Brad Evans speak at Seattle Public Library on Saturday, March 22 at 2 p.m.